Rien Pipe uses no activated carbon or similar materials, nor any cartridges, electronics or filters containing chemical liquids. Instead, the ultra-precise micro-sized hole in the top of the Rien Pipe regulates the amount of air you inhale when smoking. This helps diffuse the smoke inside the filter chamber, gradually cutting down the amount of inhaled nicotine. Rien Pipe has been designed to be a snap to use: simply attach the right pipe for the day and smoke away as usual. 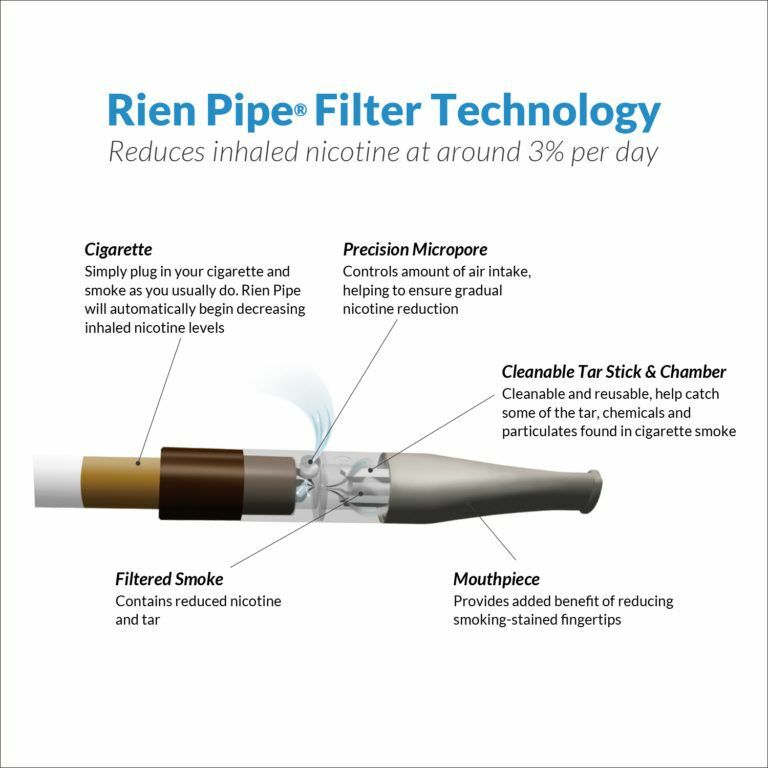 Rien Pipe immediately starts filtering out nicotine right at the source. No trying to figure out guesswork or additional frustration involved. Our trade secret and patented precision technology is used in 8 of the 31 pipes (numbers 2-9), allowing tiny amounts of air to enter the Rien Pipe filter chamber. For example, the diameter of the hole in pipe No. 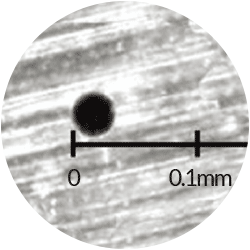 2 is 30 microns, and 60 microns for pipe No. 3. We use 1/1000 of a millimeter - 1 micron - to effectively cut nicotine intake, helping you quit without uncomfortable side effects. Except for the first pipe, each of the 30 pipes contains a precision-drilled hole that helps control the amount of air that's inhaled with each puff. The size of this aperture increases as progress with the Rien Pipe program, gradually increasing the amount of air taken into the chamber, subtracting the amount of nicotine inhaled through dilution. These holes are designed to reduce the amount of inhaled nicotine by 3%. Even from Day 1, Rien Pipe's tar-catching core goes to work in reducing nicotine. 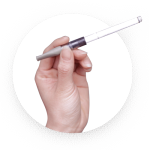 Our reliable, ultra-precise Japanese technology can be trusted to help you reach your goal to quit cigarettes. By weaning you off the physical addiction to nicotine, taking the next step toward quitting smoking altogether becomes easier for many of our customers. This gradual subtraction methodology is the main reason Rien Pipes are very successful and worry-free versus pills, inhalers or patches. 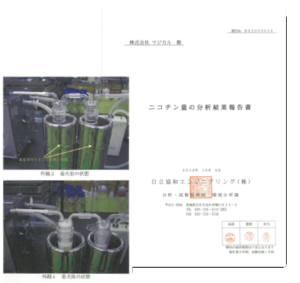 Rien Pipe was testing at an independent lab in Japan (Hitachi Kyowa) to verify that it steps down nicotine levels in inhaled smoke, at which time both the progressive cut along with the 95% cut by Pipe #31 had been confirmed. In addition, before being sealed and packaged, each individual Rien Pipe is quality-tested to ensure that it falls within the tolerances required for a reduction rate of around 3% per day. Products falling outside this precise range are rejected.